For a long time, people have been asking me when I’m going to create a book of my art. The answer: in April 2015! 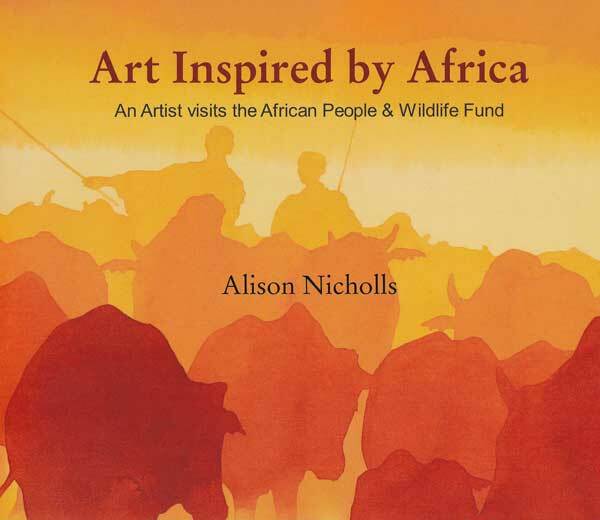 It will be the first in a series titled Art Inspired by Africa and this book is subtitled An Artist Visits The African People & Wildlife Fund. 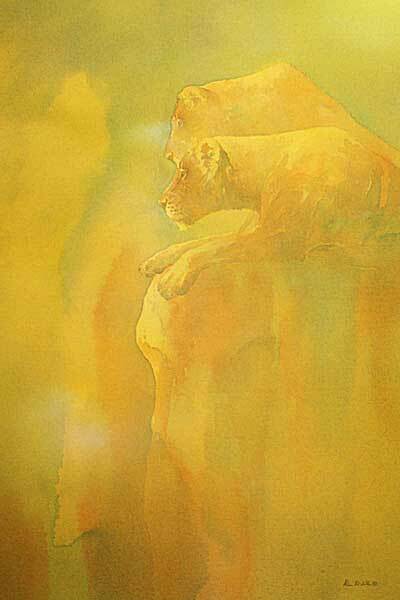 It will feature my field sketches & studio paintings, a Foreword written by Dr Laly Lichtenfeld, Executive Director of APW, and contributions by other APW staff. 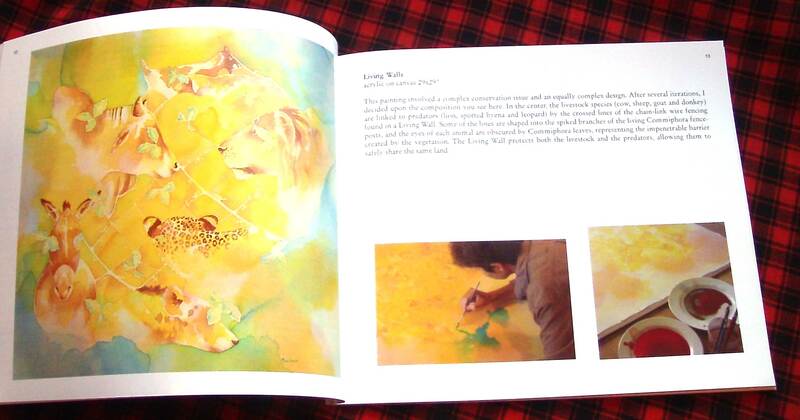 And of course the book is full of my art images, pieces about my conservation-themed paintings, and excerpts from my field journals. 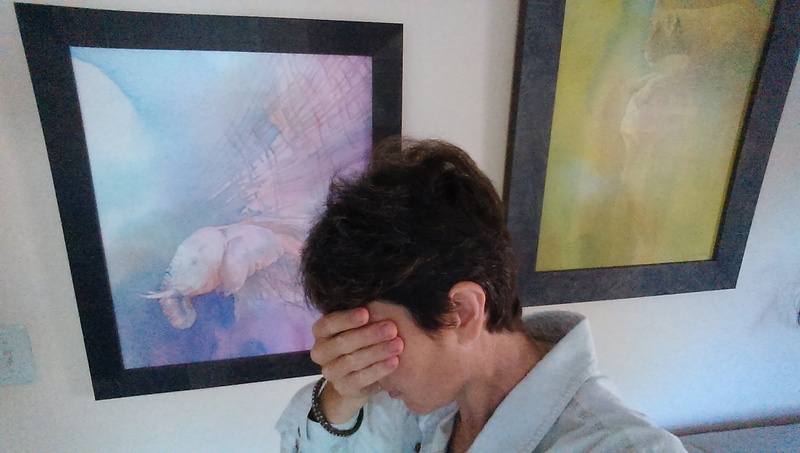 Right now I’m deciding on the cover design and I’m asking for your help. Give me your opinion and your name will be put in a hat to win a signed copy. All you need to do is leave a comment with your choice – Option 1 (white cover) or Option 2 (yellow cover). I’ll be announcing the winner on March 31st, 2015. So, what do you think. Option 1 or Option 2? 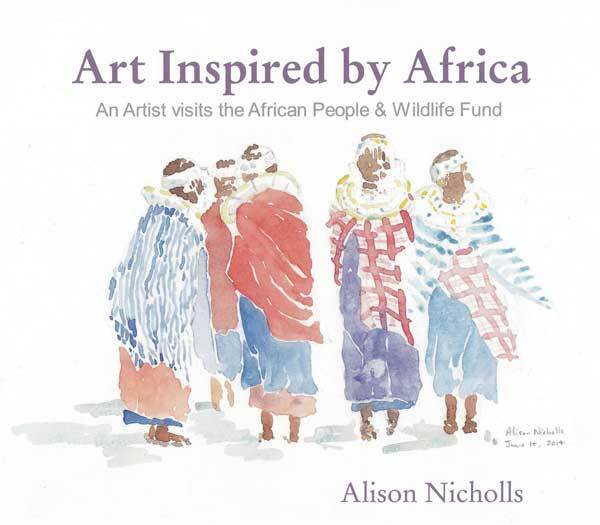 This entry was posted in African People, Blog Posts and tagged African People & Wildlife Fund, tanzania on March 14, 2015 by Alison. 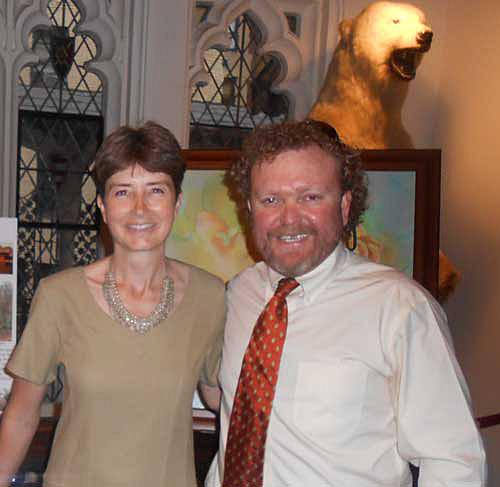 Alison Nicholls at The Explorers Club with Charles Trout, Director of Programs at the African People & Wildlife Fund. Charles introduced Alison’s lecture: African Conservation through the Eyes of an Artist. 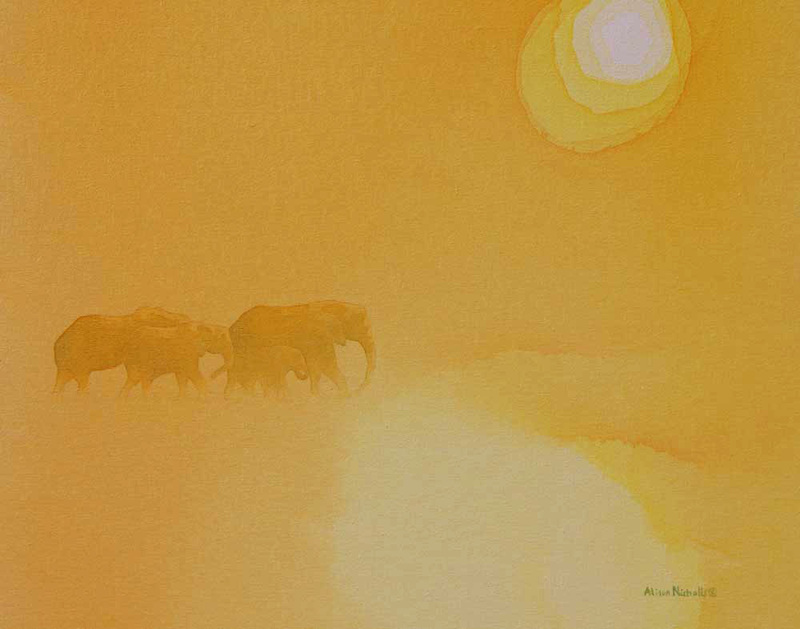 I recently gave a lecture, African Conservation through the Eyes of an Artist, at The Explorers Club in New York City. The lecture was very well attended and I was fortunate to be introduced by Charles Trout, Director of Programs for the African People & Wildlife Fund in Tanzania. Charles gave a wonderful introduction, speaking about my visits to APW and the effect my art has had on APW’s educational programs and work with the local community. Here are a few images of the pre-lecture reception. It was a lovely evening so we were able to make use of both the library and the outdoor terrace. The lecture was also live-streamed on the club’s website and I was delighted to receive comments from those who also watched it online. The recording of the lecture will soon be available online and I will include a link to that very soon. The evening was made even more special by the fact that my parents, who live in the UK, were visiting and were able to attend. 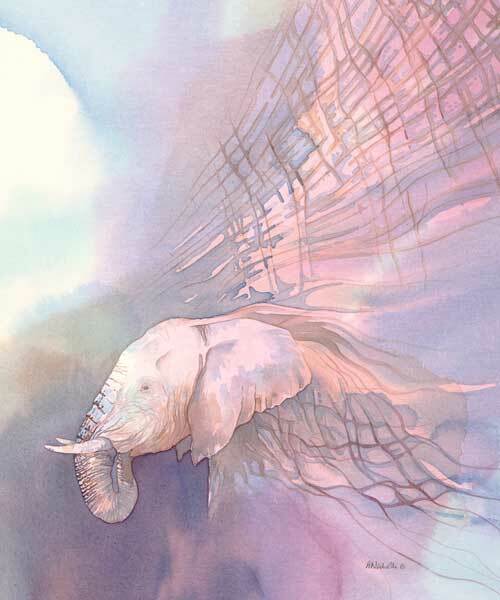 All in all it was a great experience and I hope that I can continue to use my art to raise awareness and funds for some of the great conservation organizations doing such valuable and inspiring work across Africa. I live in Westchester County, near New York City. It is classic commuter belt territory, where there are many families with children. So when I meet someone new, the question “do you have children?” often comes up. When I answer “no, just a dog” the conversation usually comes to an end. People are too polite to ask why I have no children, perhaps thinking it wasn’t possible for me to have any, so I often say “I chose not to have children”, just so they don’t feel uncomfortable. In rural Tanzania (and most rural parts of Africa) a related but slightly different question comes up: “how many children do you have?”. My answer is also slightly different. I just say “none” and smile broadly because I know that the next question will be “why not?”, accompanied by a horrified expression. When I say I chose not to have children I get exactly the same response again, “why not”, still accompanied by a horrified expression. Then I have to explain how different my life is and, frequently, the women I am speaking to will offer to give me a child. I’m never quite sure how serious they are but I’ve noticed that they always offer me a young girl, never a boy, because boys are considered more valuable (that is whole other blog post in its own right). We all laugh but I know that they now have serious questions about my sanity! How Many Children Do You Have? The Universal Question. The Africa Geographic website is host to numerous fascinating blogs featuring photographs, articles, travel news, opinions and wildlife sightings from all over Africa. 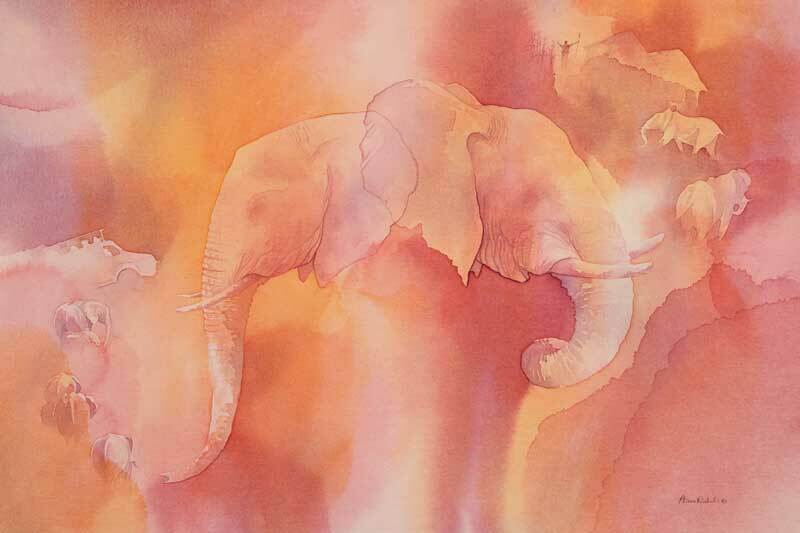 But there were no blogs associated with art, so I approached them with the idea of a new blog series called Art of Africa. I’ll be posting regularly to Art of Africa but don’t worry, I will continue to post unique content here as well. 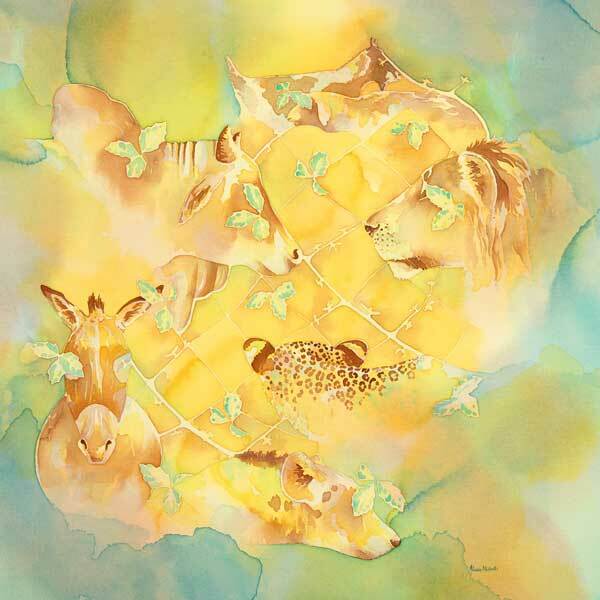 Why don’t you check out my 1st Art of Africa post and leave me a comment – it will be much appreciated! 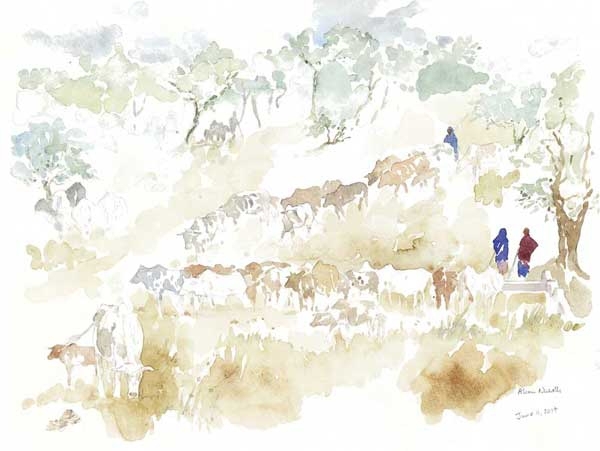 Art of Africa – Sketching Among the Maasai. This sketch captures everything I enjoy about field sketching. People. Animals. Color and pattern. Speed. Simplicity. You might be thinking that it doesn’t look all that simple, as it contains a woman, her child, a cow and a calf, plus the brightly colored, patterned shuka. But in reality, the sketch was very simple. The heads of the woman and her child are just simple shapes and I didn’t include the pattern on the shuka, just lines to show the main folds. The cow required more detail, just to get the perspective right and perhaps most importantly, to show that the woman’s head is leaning against the cow’s flank, highlighting the connection between them. Although the shuka covers the calabash the milk is being collected in, you can still tell what is happening here. I did many pencil sketches in quick succession on this morning, then added watercolor later that day (I don’t use photos or video to do this and I always finish my field sketches in the field, so that I can honestly say they were completed on site). 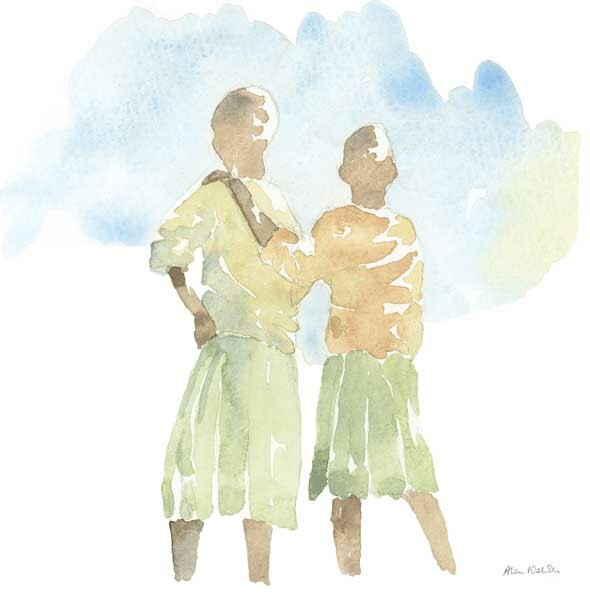 I am, as ever, grateful to the friendly people of Loibor Siret in Tanzania who allowed me the wonderful opportunity to sketch in their home. I am packing up copies of all the sketches I did that day to send to them. 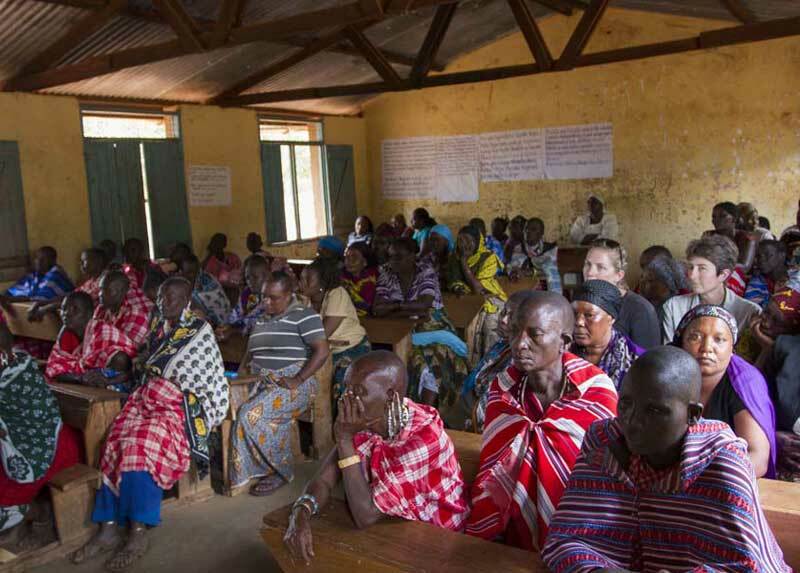 I am also grateful for the opportunity to stay with the African People & Wildlife Fund who are doing great work with communities on the Maasai Steppe of northern Tanzania. 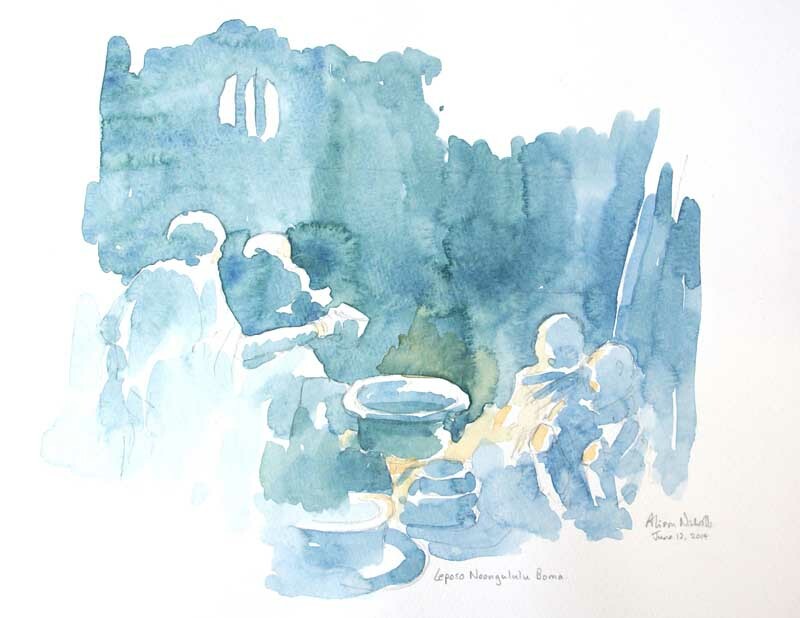 Mother’s Milk Field Sketch By Artist Alison Nicholls. Shukas are the pieces of cloth, often patterned and brightly colored, which are worn by the Maasai of East Africa. So why am I being dressed in shukas in this photo? Because I was asked to be Guest of Honor at the Loibor Siret Primary School for their end of school prize-giving ceremony! 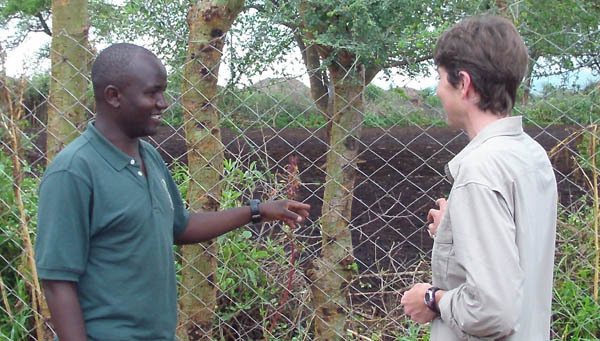 I was visiting Tanzania to stay with the African People & Wildlife Fund, who are based close to Tarangire National Park. I have visited 3 times now, sketching on site and learning about their work helping communities manage their natural resources for the mutual benefit of people & wildlife. 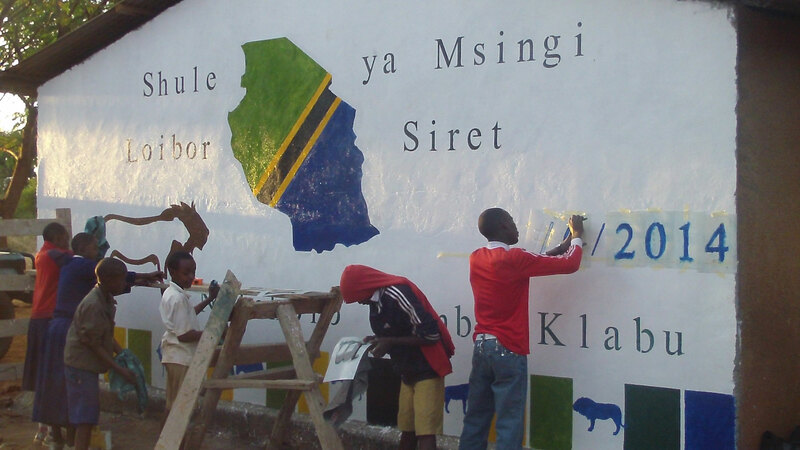 During my visits I have taught a number of drawing classes at the school but on this trip I had also arranged to stencil some of the classrooms, paint one of the end walls of the school, and hang the village of Loibor Siret’s first artwork exhibition (more posts about all this will be coming soon). It was an unexpected and very pleasant surprise to be asked to be guest of honor at the school closing a couple of days later. I knew I would be asked to give a short speech so I wrote it in English and asked Everest, who works at APW, to translate it into KiSwahili for me (the language that everyone learns at school in Tanzania). I think there was a little doubt that I would be able to read the speech in KiSwahili, but it is written phonetically so after a couple of practices I was fairly understandable! In the speech I congratulated the students who were to receive prizes, but reminded all the others that they should work hard because they too have the gift of education, a gift which can help them, their families, their community and their country. After the speech was the prize-giving, where children received gifts of books, pencils and protractor sets. I also gave 2 prizes of laminated copies of my paintings, for the best girl and boy in the art class the previous day. Then it was announced that there was a gift for me and I was dressed in my 4 shukas by 2 of the girls. I’m so pleased to have a real Maasai outfit. Now I just need to start collecting the jewelry! Why Am I Being Dressed in Shukas? By Artist Alison Nicholls.